Traditional psychotherapy approaches, focusing on working with and correcting mental events and conditions, have placed little importance on the fundamentally physical nature of the person. Yet many of the problems people bring to therapy are linked with or manifested in the body--such as obesity, psychosomatic distress, chronic tension, and sexual problems. This book provides a therapeutic approach that addresses both the physical and mental nature of clients. 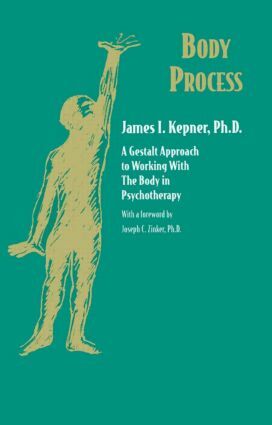 In this book, James Kepner shows that a client's posture, movements, and bodily experiences are indeed relevant to therapy, and he offers an insightful framework for incorporating these aspects into a therapeutic framework. This comprehensive treatment explains how body work can be integrated with the aims, methods, and philosophy of psychotherapy, offering a framework within which practitioners of different theoretical approaches can better appreciate body processes in the context of the whole person, rather than as isolated events. This book, including an updated introduction by the author, explores the range of body work in psychotherapy, from the development of body awareness to intensive work with physical structure and expression. And it demonstrates how this approach can be particularly effective with a range of clients, including survivors of sexual abuse, recovering drug addicts or alcoholics, or those suffering from chronic illness. "I was first introduced to the important work of Jim Kepner by Tom Cutolo, Rubenfeld Synergist and Colleague. Body Process is a must for all professionals who want to understand and experience the body's role in psychotherapy from a truly holistic perspective. Bravo!" "A wonderful introduction to the wisdom of the body in psychotherapy." "A guide to psychophysical process that should be required reading for all massage therapists and other body workers." Introduction: Body Process and Psychotherapy. Part I: Basic Principles. Self and Embodiment. The Body and the Disowned Self. Approaching the "Person as a Whole." Structure and Process: The Organization of Body and Self. Resistance and Body Process. The Therapeutic Use of Touch. Part II: Body Phenomena and the Cycle of Experience. Sensation and Body Process. Figure Formation and Body Process. Mobilization and Body Process. Action and Body Process. Contact, Final Contact, and Body Process. Withdrawal, Assimilation, and Body Process. Appendix: A Comparison of Reichian and Gestalt Therapies. James I. Kepner, Ph.D., is co-founder and chair of the advanced training program Working with Physical Process as the Gestalt Institute of Cleveland. A pioneer in clinical work with the embodiment of experience, he teaches this work widely around the world. Kepner's own clinical grounding is supplemented by training in a wide range of healing arts. He is also the author of Healing Tasks: Psychotherapy with Adult Survivors of Childhood Abuse.